If you believe that the University of Guam should support bilingualism and encourage through its curriculum the learning of the many languages from this region and beyond, please read below the statement of our "UOG Language Drive." 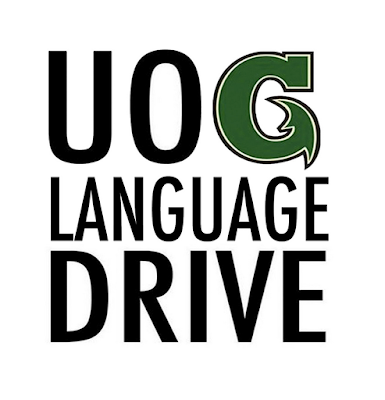 Faculty and administrators at UOG are planning on reducing the required language classes for undergraduates from 2 to just 1 next year. This would reduce the language learning for all students from a single year (8 credits) to just a single semester (4 credits). Students could still take more courses if they wanted to, or if their major required it, but in general this will lead to a severely negative impact on any programs, such as mine, Chamorro Studies that are language focused. Please read this statement, written by a group of faculty including myself, and consider signing our Protect Languages at UOG Petition. The purpose of this signature drive is to promote and to advance language learning at the University of Guam. I traveled to Japan last month with Ed Alvarez the Executive Director for Guam's Commission on Decolonization. We were in Japan for just a few days but we were able to give a number of talks at two universities in the Kansai area thanks to our friends Ronni Alexander (Kobe University) and Yasukatsu Matsushima (Ryukkoku University), who arranged our visits to their institutions of higher education. 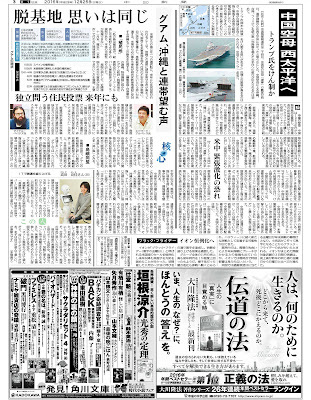 Our visit also got us some coverage in the newspapers Tokyo Shinbun and Chunichi Shinbun. I have no idea what they are saying in the articles or in this article below taken from the website for Ryukkoku Uniersity, but I am hoping they are either speaking positively about the message we had about decolonization in Guam or about the illustrious nature of my beard. Si Yu'us Ma'åse ta'lo nu si Ronni yan si Yasukatsu para i ayudon-ñiha gi este na hinanao! Gof ti apmam, lao gof gaibåli sinembatgo. Film-making was something I never really imagined myself doing, even though I've always been drawn to films as a media. 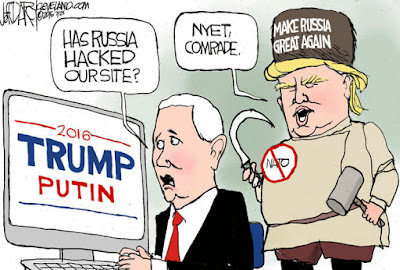 Gof ya-hu manegga' mubi siha. Lao gi minagahet taya' nai hu konsidera na sina mama'titinas yu' mubi siha. Over the past few years I've been able to work on several projects, sometimes as just a consultant, sometimes as a supporter and a few times as one of the primary filmmakers. It has been exciting and naturally time-consuming. Here is one film that I did a small amount of consulting for, with the help of Ken Gofigan Kuper who is attending graduate school at UH Manoa. While most people were spending December with their family or shopping, I spent much of it conducting outreach on Guam's decolonization. The Commission on Decolonization held three public village meetings over the course of one week. 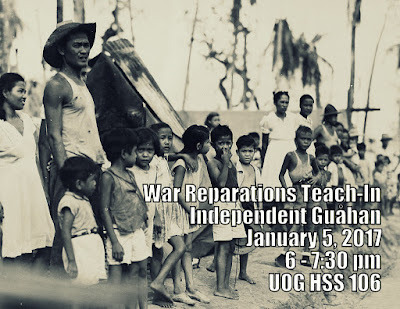 Independent Guåhan held its monthly General Assembly, and we also launched our weekly podcast series. Here are some articles below detailing some of our activities. The Commission on Decolonization held the first of a series of village meetings arranged to discuss Guam’s political status yesterday at the Dededo Community Center. Revolving around the island’s long-delayed plebiscite that has been in discussions since 1998, the commission has finally launched the village meetings as an educational campaign on the three proposed political options - independence, free association and statehood. Un apå'ka na taotao, i na'ån-ña si Paul Zerzan, sigi ha' umalok gui' gi gasetan Guåhan na esta måtai pat esta taisetbe i Fino' Chamorro. Esta ha na'bububu meggai na taotao guini giya Guåhan yan gi sanlagu lokkue'. Estague diferentes na kåtta ginen i PDN ni' kumokontra i taihinasso na tinige'-ña. My column this week is written in response to Paul Zerzan’s op-ed on Oct. 29 dealing with the death of the Chamorro language. This article about my grandfather, the Chamorro Master Blacksmith Joaquin Flores Lujan or "Tun Jack" was first published in the Pacific Daily News on October 14 and October 21, 2016. I have been missing my grandparents like crazy since they passed away in 2013 and 2015, and sometimes only writing about them can help me overcome the sadness I feel. December is always difficult, as this is the month that grandma, Elizabeth Flores Lujan, passed away three years ago. This is also a difficult month emotionally because of all the family emphasis and for Chamorros, the fact that December 8th represents when our elders, i mamparientes-ta, i manamko'-ta, were swallowed into the beast of a great war.